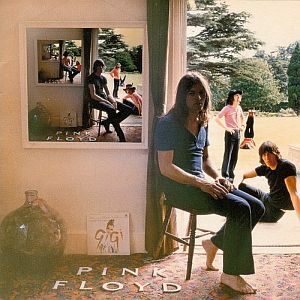 Ummagumma was originally released as a two-LP set back in 1969. Two words come to my mind every time I listen to this: insane and genius. Ummagumma is clearly the most experimental work released under the Pink Floyd name. What is so interesting about this is that the studio LP was basically divided up into four, with each group member composing their quarter of the disc. What also catches my attention is how skilled each of them were in composing "solo" material for this project. Every song on the studio LP is remarkably done with an eerie weirdness to each piece. The effects employed on Several Small Species... is just mind-blowing. The other LP is made up of live material and the selection is superb, including Astronomy Domine, Careful with that Axe Eugene, Set the Controls for the Heart of the Sun and Saucerful of Secrets. This is the perfect material for what was considered a psychedelic jam band at the time allowing them much room for aural explorations. These live performances are simply stunning. Unfortunately, they will be the only live material the band would release until 1988's Delicate Sound of Thunder. Some listeners may find this album difficult to get through due to its experimental leanings, but nonetheless, I'm one that enjoys stuff like this and have considered this a masterpiece since my first listen many eons ago. It's not like a Selling England by the Pound or a Close to the Edge. It is a very different kind of masterpiece. You might want to avoid if you don't have a liking for the experimental (try Wish You Were Here instead if this is so). Otherwise, five stars and another piece of the foundation for future experimental explorations.